Optimists Die First centres on Petula who is struggling to cope with family tension and the death of her younger sister; of which she feels personally responsible for. Petula is terrified of doing anything that may result in a negative outcome, mainly death, and keeps a scrapbook of freak accidents to prove her point. She suffers from panic attacks, attends counselling, and a weekly Youth Art Class with other teens needing support. Through this class she meets a variety of people, each with their own struggles, one of which is a new boy called Jacob who lost his arm in a car accident. Jacob and Petula are paired together to work on a class assignment in which they have to adapt a scene from Wuthering Heights into another format. As is to be expected, they bond over their time together and learn about each other and what problems they’re trying to work through and they become quite close. Oddly enough, it’s rare that I read books where the actual protagonist really sticks with me after finishing but Petula really surprised me. I’m not a big fan of YA contemporary as they always steer to romance (and this had its fair share) but Petula felt so real. The reasons for how she was, while unhealthy, felt justified given her backstory and the book being from her perspective really helped gain an understanding of trying to fit in and learn to live, even within the tight restrictions she’d placed on herself. Several times I found myself wanting nothing more than to climb into the book and give her a hug. As her relationship with Jacob develops she starts to take more risks, doing some things even though she’s analysed the dangerous outcomes several times and then there comes a point when she doesn’t even think about them anymore. And if that isn’t a beautiful progression of a character then I don’t know what is! Another seemingly minor aspect I really enjoyed was the mention of birth control. When it comes to that stage of a relationship, especially in a novel about teenagers, I don’t think birth control is mentioned that much so it was wonderful to have a character like Petula who, not only decides to go on birth control but actually involves a parent in her decision. There’s even a segment where Petula recalls going to the doctors and getting the implant. The Youth Art Class teens starting to talk to each other and spend time together reminded me of The Breakfast Club gang and it was just really nice to see these characters start to open up a little to each other. This is the sequel to Giovanna’s debut novel Billy And Me. Sophia May is about to partake in the most monumental part of any relationship: meeting the parents. The story opens with her waking up on a plane to LA, anxiety bubbling under the surface. Billy is taking a break from the acting world and the pair decide to spend the festive Christmas/New Year period with his family. LA is a complete different world to Sophia’s tea shop on the hill and she finds it hard adjusting to the flashing cameras following her around. When a hotshot director offers Billy a role in his new movie, the break quickly comes to an end and Sophie finds herself flying back to England; alone. In a recent interview, Giovanna said that she never feels like stories end at the last page as the book, much in the same way that life continues after monumental events take place in life. She finished the short story Christmas With Billy And Me then found herself wanting to know what happened when the couple made it to LA. So she wrote it to find out. This is a really good, solid sequel. It was full of wonderful moments and very well paced. Everything felt like it happened exactly when it needed to in order to push the story forward. The lost act of letter writing being brought in as a romantic way of communication between the pair was just so heartfelt. The only thing that let this book down for me was the horrible “can a man and woman really be friends?” cliché. It wasn’t really needed and I just dislike that concept. Other than that, this book was another fantastic creation from the mind of someone who was born to write. I’m not one to actively put up romance / contemporary books unless it’s by another I’ve previously read (such as Cecelia Ahern and Giovanna Fletcher) but when I saw the trailer for the upcoming film adaptation, I found myself completed to read it. The protagonist of this story is Louisa Clark. She’s twenty-six years old and stuck muddling through life. She doesn’t have any qualifications to get a decent job and her fitness-obsessed boyfriend doesn’t have much time for her. When she finds out via her local job centre that a family is looking for a carer for their son, she thinks she’s nowhere near the right person for the job, but she can’t deny the money is good. She takes it and Will enters her life. Will Traynor was injured in a motorcycle accident which resulted in him being wheelchair-bound, unable to move most of his body. He’s bitter, mad at the world and hates that everyone makes decisions for him; not caring what he actually wants. When Louisa Clark bumbles into his life with her ridiculous clothing choices, he doesn’t think his life can get much worse. While my initial point isn’t entirely book related, I feel I need to express it: Emilia Clark and Sam Claflin are the perfect acting choices for these characters. Naturally, I pictured those actors as Louisa and Will in the images in my mind while reading, but they will a great fit, I am very sure of that. This was a very easy read despite the serious and sad themes that spread through the pages. I found Louisa to be such a compelling character to follow through this story. However, there were random instances of chapters from other characters perspectives such as Nathan – another medical carer – and Will’s mother and while I understood what they were trying to convey (understanding and an outside perspective) they just felt jarring and out of place. I loved seeing how Louisa became more sure of herself. Her growth throughout the chapters was so beautiful to witness while she dealt with a very temperamental person on a daily basis. Will is a horrible character and no matter how nice people are to him, he has quite a sharp tongue. And I actually liked that about him: it made him feel more real that a little trip out to a racecourse wouldn’t change his perspective. The wonderful thing about their relationship is that Louisa is the first person to see and speak to him as a person, not the person stuck in a chair who can’t eat without help. But Will has a dark secret and when Louisa discovers it, she realises time is running out and she needs to make a plan. If you haven’t read this book and either you’ve never heard of it or you’re unsure whether to read it, ignore the blurb premise because it honestly doesn’t sell this book enough. I highly recommend it whether you frequent the romance / contemporary genre or not. Arthur Pepper is a man in his late sixties who is very much stuck in a rut. He gets up at the same time every day, eats breakfast at the same time every day, and constantly waters his plant. It’s coming up to the one year anniversary of his wife Miriam’s death and he struggles to separate his perceived memories from how she actually was, for example, he pictures her in certain clothes then goes through her wardrobes and thinks “Miriam would never wear this” even though she clearly did. One day he finds a box and inside is a charm bracelet that he’s never seen before. Examining the charms he discovered that the elephant charm is engraved with the word “ayah” and a number. Research reveals that “ayah” is Indian for nurse and he calls the number. The phone is answered by a Mr Mehra who says Miriam was his child carer when he was a young boy and mistakes he made led to her leaving and he gave her the charm as an apology. Arthur never knew she had ever been to India let alone worked there so he finds himself wondering what stories the other charms hold. He finds links between the tiger charms and a lord living at Graystock Manor and so Arthur’s quest to discover more of his wife’s secret life continues. I expect that to be the sole focus of this book but I received a lot more than I bargained for. In addition to the charm plot line, the subplots create more depth. You learn about Arthur’s estranged children, Dan and Lucy, and why they are just that. The characters Arthur meets who are linked to the charms are just so well written that they stand as potentially real people with their own complexities. They didn’t feel like they were just there as part of a series of events and left a lasting impact. I found Arthur selfish at times such as a moment of reflection where the prose shows he never asked his wife about her life before they met because he “never expected her to have one” but he’s a man who had his life toppled over so I could cut him a bit of slack. He throws his routine out of the window and ventures places he’s terrified of going to, pushes his boundaries just to learn more about the woman he loved. This leads him to reconcile with his family, grow as a person but most importantly, let his wife go. The Curious Charms Of Arthur Pepper is an absolute delight that you don’t want to miss. Blurb: “Victoria Mahler is the sixteen-year-old only daughter of rocker Micky Wayne, whose band, Dusty Moon, took the world by storm when Micky was just a teenager. The band broke up under mysterious circumstances, but, after years spent off the road being a mom, Micky’s solo career is finally starting to take off. When an offer to tour Japan falls into her mom’s lap, Vic is left to spend the summer under the care of her distant grandmother, and without her built-in best friend. Fortunately, a boy with a secret geek side and a group of feminist game-makers save the season, and Vic starts to see herself as her own person, out from under her mother’s shadow. The story follows Victoria who has spent her life growing up in her mother’s shadow. Why you ask? Because her mother is Micky Wayne, the ex-frontwoman of a popular band called Dusty Moon. The group has long since disbanded but Micky took on a solo career. Every year on the Island there is a big music festival, and this year they’ve asked Micky to play. Victoria takes a back seat for a fair amount of the novel as she tells the teacher about Micky: her life in the band, her tackling being a mother, her life after the band. While Micky is interesting, cool, rocker mum, and certainly catches the reader’s attention, I was curious to learn who Victoria was when her mum was taken out of the equation. Victoria is a typical teenager. She spends time working on things with her best friend (mainly ideas for a video game) and crushing on a boy she worked with once on a drama project a while ago. The boy in question is Shaun and she plucks up the courage to ask him out on a date. Everything goes well… until she accidently takes him to a nudist beach. And after the date she has a bike accident leaving her with a broken arm. Victoria is flying high until Micky announces she is going on tour in Japan for two weeks, to be followed shortly after by a six week tour of Europe. So Victoria gets dumped on her Grandmother. Then she discovers that Shaun, now her boyfriend, is a massive fan of Dusty Moon and he doesn’t know who Victoria’s mum is. It’s just a simple, coming of age novel, featuring your typical teenage things but that doesn’t make it any less of a book. I think this story will stay with me for a while. Giovanna Fletcher’s second novel Dream A Little Dream came out in June this year, published by Penguin. 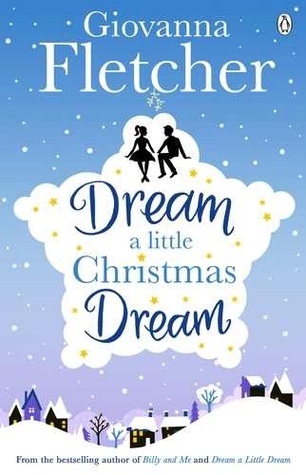 Dream A Little Christmas Dream is a very short spin off featuring the characters from the full length novel I’ve just mentioned. This is not the first time Giovanna has done something like this: just last year she released a Christmas spin off to her debut novel. What I love about these little novellas is that it’s a neat way of revisiting the characters I once became so attached to. While Dream A Little Dream wrapped up nicely in the end, I still found myself with a few questions about what happened after the end of the book. Then Giovanna announced the spin off. This novella keeps in some of the best bits from the original novel: the dreams. And even though some of them were a little on the disturbing side, I found myself belly-laughing all the same. So, like the blurb suggests, Sarah’s life is going pretty well. She’s bagged the man of her dreams (literally) and things are going swimmingly at her new job. However,when Lexie announces that she’s having a baby, and Carly is moving out, it’s hard for Sarah not to feel like her relationship has come to a bit of a stand-still. When she hints this to Brett and he doesn’t seem to get the message, Sarah is left feeling unloved. Giovanna has a talent for writing light,enjoyable reads that don’t skip out on some of the not-so-good parts of life. This novella has left me feeling festive: ready to pull on a thick wooly jumper, grab a mug of hot chocolate and sit down to watch Love Actually. Also, I finally have an answer as to what happened with the TV show “Grannies Go Gap” – Thanks Giovanna! I made this blog because I am an avid reader and writer of Young Adult literature. I wanted to use this blog to rant and rave about my favourite reads, however, to ignore the not-so-great ones would be doing a disservice to those who read my blog. This isn’t a book I would have picked out myself if I saw it on a shelf. It was given to me as a present last year. I originally liked the idea. The blurb is very intriguing which I’ve often found rare in Young Adult. Yet, when I started reading it, I instantly discovered a problem. The story follows a group of high school teens who all get vaccinations. For some reason, they begin hearing voices and come to the realization that they can hear people’s thoughts. Wonderful idea and I love the originality here, but the problem for me is that it felt too rushed. The big reveal as to why they have suddenly gained these powers comes very late in the book and I feel it would have felt much better learning this halfway through and then dealing with other aspects after. Instead, you’re basically told “this is why this is happening now turn the page, oh look you’ve finished the book!” It made me feel uncomfortable. Truthfully, the only reason I persevered with this book is because it counts towards the 2015 reading challenge. If it wasn’t for that, I would have given it up after the first few chapters. The character introductions were far too quick. You were bombarded with too many characters at a time and then there wasn’t much effort made to distinguish between them. They weren’t fleshed out enough for me to be able to relate to any of the characters or care what happened to them. While I read primarily YA Fantasy, I do like the occasional YA contemporary romance but this just wasn’t it.